See my background for why I feel compelled to critique Sofia Smallstorm's video. In How to Counter Group Manipulation Tactics, the Techniques of Unethical Consensus-building Unmasked, on page 20, Beverly K. Eakman wrote "Framing the debate is key to keeping control of the psychological environment. When you frame the debate, you direct, or drive the discussion; that is, you deflect attention from the real agenda. In effect, you tell people what they are going to think about and for how long." On December 18, 2012, just four days after the shootings, the SGT Report (created December 7, 2010) published the following, "Firearms industry expert and part-time police officer Mark S. Mann (pseudonym) lives in Connecticut, just miles from the massacre at Sandy Hook Elementary. He’s been following the story closely, talking to cops he knows in the area and he will be reporting for us as this story develops. Mark says there are just too many inconsistencies with the ‘official’ story and he says, 'things don’t add up.' As we all now know, regardless of whether the mass murders of children and adults at Sandy Hook was a false flag operation, or the actions of a lone nut, the establishment intends to use this event to attack the Constitutional rights of law abiding Americans – they’re coming after the guns." 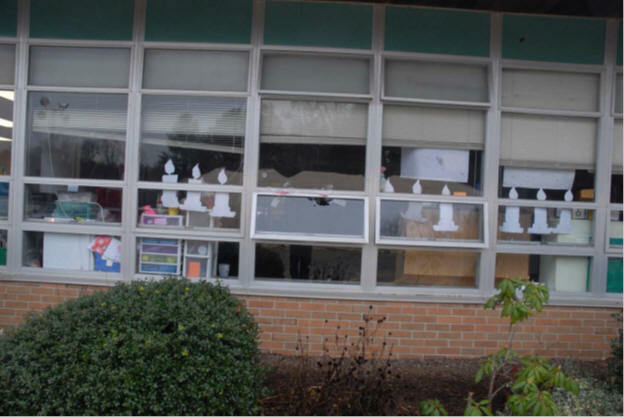 On December 20, John Friend, on his web site, said, “At this point, it is safe to say that the official narrative of the Sandy Hook school shooting is fraudulent, and a major cover-up and PSYOP is underway.” On December 20, 2012, Dr. James Tracy wrote an article titled, Analyzing the Newtown Narrative: Sandy Hook’s Disappearing Shooter Suspects. On December 21, Jay Johnson, on his web site, Sandy Hook Hoax (created December 21, 2012) said, “I think the idea of a young man shooting kids for no reason is a black op type psychological operation and did not happen, and is therefore a hoax.” On December 24, 2012, Tracy wrote The Sandy Hook Massacre: Unanswered Questions and Missing Information in which he states, "one is left to inquire whether the Sandy Hook shooting ever took place—at least in the way law enforcement authorities and the nation’s news media have described." Why should any logical person accept these views? Are these people smarter, more intuitive or discerning? Do they have inside information or are they quite simply framing the debate? If so, why? On December 15, 2005, Dr. James Fetzer co-founded, with Professor Steven E. Jones, Scholars for 9/11 Truth for which one had to be vetted in order to join. The group accepted me, an ordinary person who had written some articles about 9/11. Then, my ego was inflated; who wouldn't want the designation of a scholar? On December 27, 2012, Dennis Cimino and Dr. Fetzer co-authored an article for Veteran's Today, Sandy Hook: Huge Hoax and Anti-Gun “Psy Op.” Regarding Veterans Today, Gordon Duff said, "... about 30% of what's on Veterans Today is patently false." and "...about 40% of what I write is at least purposely partially false..." Fetzer left Veterans Today and Duff removed all of Fetzer's articles but then restored them on May 1, 2015 which skews the date of the original article. On January 16, 2013, Joyce Riley interviewed Mike Hollingsworth, aka Mike Powers, on The Power Hour. He claims that, logistically, Lanza could not have carried off the shooting. On January 19, Mark Howitt published his video, Sandy Hook - The Documentary, Official Video, Part 1 of 2 (interesting title). Then on January 30, six weeks after Sandy Hook, Cimino and Fetzer co-authored The Nexus of Tyranny: The Strategy Behind Tucson, Aurora and Sandy Hook in which they introduced 14 points (see below), which others have adopted. 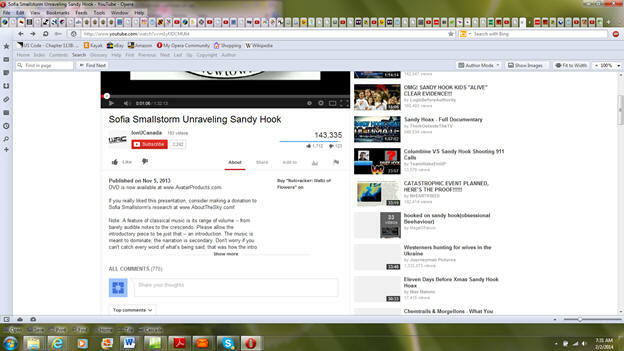 Sofia Shafquat, aka Sofia Smallstorm used 12 of the 14 concepts in her video, Sofia Smallstorm Unraveling Sandy Hook. I have indicated those in RED text below. Others will predictably embellish what she has disseminated and begin going down multiple rabbit holes. While some people might be very sincere, provocateurs often use the Delphi Techniques to build a consensus (predetermined outcome), in a psychological environment. On page 10 of her book, Eakman wrote, "The Delphi Technique is just one unethical method of achieving consensus on controversial topics. A well-trained, professional agitator (provocateur) will deliberately pit one faction against another to make the favored side appear 'sensible' and any opposing view ridiculous." In such an environment, agitators, using mob censure, will ridicule people who reject their concepts. In demonizing skeptics, they engage in ad hominem attacks, which involves attacking an opponent's traits as a means of invalidating his/her arguments. This tactic takes the focus off of real evidence, allowing them to ignore it and avoid legitimizing their spurious claims. On February 1, 2014, I invited Smallstorm to be a guest on my RBN program but she politely declined stating, among other things, that she preferred to do programs with hosts "who have a good understanding of the material," a pretty laughable comment. So, to gain "a good understanding of the material," I evaluated her video and found numerous inconsistencies. It appears that she based many of her claims on speculation and questionable sources rather than on facts. This is NOT a critique of her as a person but of her allegations and conclusions, as presented in her film. In the first two frames below, I have supplied the descriptions that accompany two videos on the Internet based on Sofia Smallstorm's (Shafquat) presentation at the Conspiracy Con at Milpitas, California, June 1-2, 2013. People obviously filmed her presentation and she created Video 1 that she released on November 5, 2013 for $25. Peter Klein created Video 2, published on December 15, 2013. Hopefully, the text in the rest of my critique is self-explanatory. 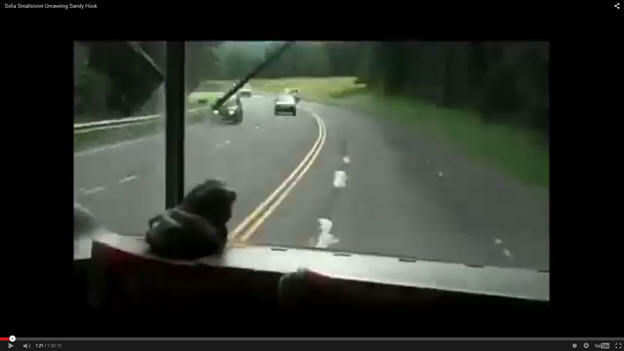 Before continuing, please watch the first few minutes of Video 1 or Video 2; where you will see a school bus making its way to the Sandy Hook Elementary School. Smallstorm endorses both videos. Then please return to this page and review the following critique. My remarks regarding the first two frames are in RED. If you really liked this presentation, consider making a donation to Sofia Smallstorm's research at www.AboutTheSky.com! She may use music to obfuscate or distract you from the audio that she does not want you to question. Videos, similar to TV, is about people programming. That is why it is used and why it is so popular for mass brainwashing. When people donate money, they invest themselves emotionally into a philosophy and rarely abandon their dedication to those ideas or their initiator causing them to emphatically ignore contradictory information. Based on the incomparable presentation by Sofia Smallstorm, this documentary is a must-watch for any Sandy Hook researcher. This video accompanies Sofia's original presentation and spot-on analysis by adding a distinct audio/visual layer. A best effort was made to reinforce the original material, maintain accuracy and stay true to the original reporting. If you wish to feel important and call yourself a researcher, just listen to Smallstorm and she will tell you what to think. gardless of which "hook" is used, staging deceptive events requires secrecy; specifically the authorized secrecy afforded to the state. The fuel that powers conspiracy is secrecy. Ultimately, if cornered the state will invoke this privilege. So, efforts to learn the truth will be that much harder. The authority that denies our freedom through silence and deceit may be the last mountain humanity must scale to be free in the modern era. Let's all continue to learn and achieve, every one of us. Don't fear going against the general way of thinking. Great minds are currently in demand. If you have a great mind, more flattery here, you will embrace the ideas in the video. 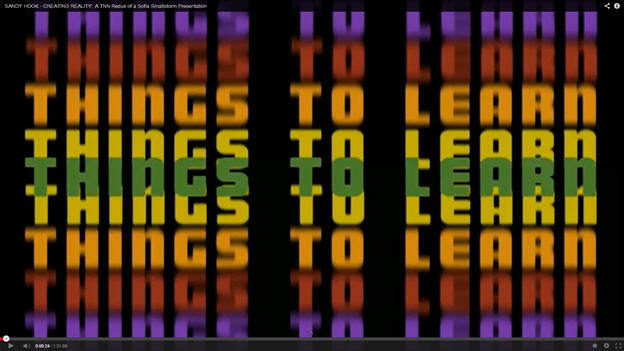 Although the screen in Video 2 (left) says "Things to Learn" it should warn people: Be on the alert, You are about to be indoctrinated. Why do we see so many views of Smallstorm and so little factual evidence? The area's history, her residency as a child and her first job do not support her claims and are irrelevant. Telling an audience about one's personal life tends to generate a feeling of trust and closeness to the speaker, which in this case, has nothing to do with providing any details to substantiate her allegations that Sandy Hook was a hoax. She alleges that the events of December 14, 2012 did not happen as reported by the MSM. Evidently, she wishes the viewers to unquestionably accept her version of the event. Smallstorm dedicates the film to America, presumably everyone, and using flattery says THANK YOU FOR BEING AWAKE which means: You are now part of the "in crowd" and are on the "good guys" team, the really "smart people" who cannot be fooled. She could have called her followers Scholars for Sandy Hook Truth but Fetzer had already used that ploy. No vetting required either - you can be as dumb as an ox or an academic or anyone in between. All you have to do is just believe. In Michael A. Hoffman's book, Secret Societies and Psychological Warfare (pp. 20-21), he states that flattery is the first principle of mind control. He wrote, "This is the first secret of mass mind control and can be observed as the foundation stone of virtually every…philosophy, system and training. The American masses are told that they are “free” and “highly-educated” when in fact we are debt slaves to the demonic, greedy money powers." (Video 1) At 1 minute and 6 seconds into the video, we see The Newtown Bee logo The Newtown Bee is the local, privately-owned newspaper that has been in business since 1877 and has reported the details of December 14, 2012 and the aftermath in hundreds of articles, including the obituaries. Smallstorm must not be aware of the newspaper's role in revealing the news about that day. 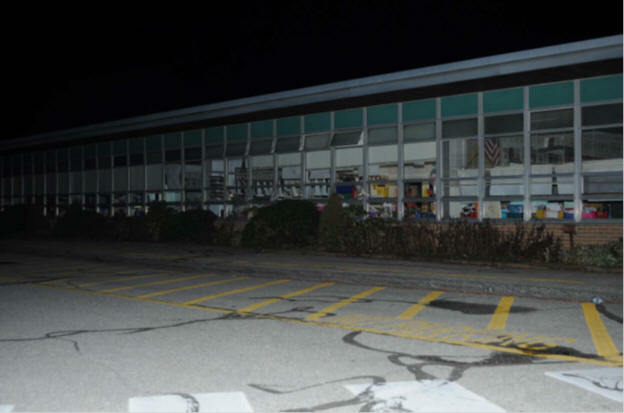 On November 18, 2013, after she published her video, the Activist Post announced Newtown Bee Reporter Unravels Official Story of Sandy Hook evidently assuming that a local reporter was claiming that Sandy Hook was a hoax. The newspaper created its video, a back-to-school video, shot long before 12/14/2012. See more about this in the notes below. *** I updated information about this issue on 2/21/2014; see below. 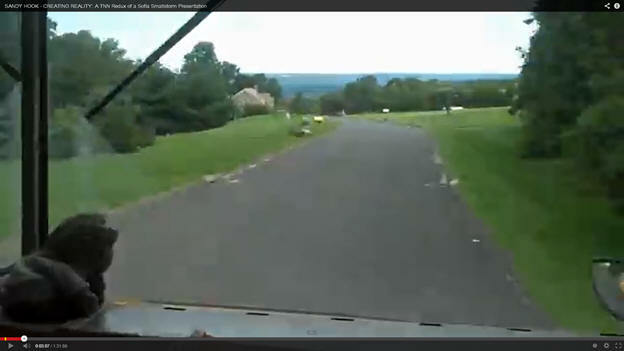 (Video 1) Please note The Newtown Bee logo in the right hand corner of their web site. Smallstorm apparently worked pretty hard to find just the right video, one of the newspaper's, to use for her own purposes. Kudos to her and her team on their research skills for finding the video. It is unfortunate that they did not read the well-researched articles in the newspaper as they would have learned much about the event. 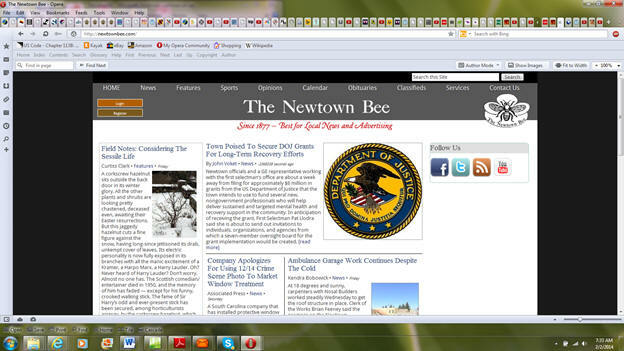 (Video 1) Take a closer look at The Newtown Bee's logo that Smallstorm used. 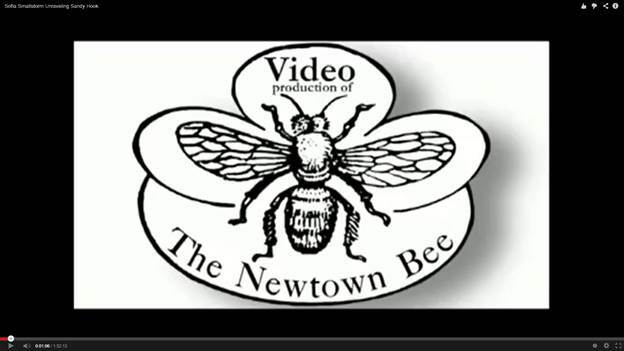 Her video states a "Video Production of The Newtown Bee." She used the newspaper's logo and a portion of one of its videos of a back-to-school segment without the newspaper's knowledge or permission featuring a school bus driver . She or someone exchanged the Bee's audio, added music** (see comments at bottom), and, in her version, we hear a man's voice which allows the viewer to assume that the driver is talking (as we never see anyone else) about how "he" thought it was impossible that Lanza, a "150-160 pound, awkward, mentally-ill kid with limited training" could carry 40 pounds (actually 31 pounds) of equipment wearing full body armor and accomplish all of that. She never says that the driver is the speaker, possibly to maintain plausible deniability. 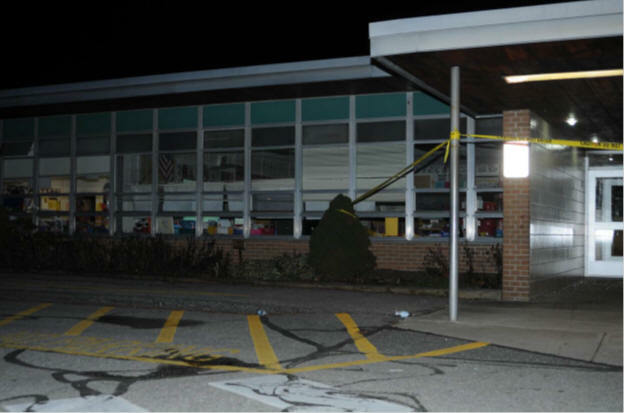 The "guy" said, to date, “I have not seen a single crime scene photograph of the inside or the outside of that school,” implying that the event had already occurred. 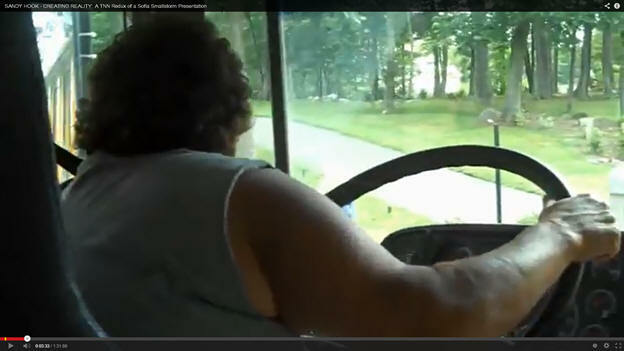 (Video 1) The "guy" states that he is 5’ 9” about 200 pounds, and is in really good shape. He says, "I train a lot, I shoot a lot and when I am wearing full body armor, the most I can carry on me is a rifle…" The "guy," if one assumes it is the driver, as you can see, does not match the description of the "guy" who is talking. Perhaps, Smallstorm is hoping that your lying eyes and ears do not notice these trifling details. She may be hoping that you are just listening to the script of some "guy," evidently in an interview conducted by "Sean" that she or someone has dubbed over The Newtown Bee's video, shot in August 2009. Notice that the music gets louder when she may be trying to cover "Sean's" voice. Please note the color of the grass which was brown by December 14, 2012 so we know that the video predated the event as it is lush green in the image to the left and below. During the entire trip to the school, the "guy," who one might assume is the driver talks about the improbability of Lanza carrying out the slaughter at the school. This seems to be a radio broadcast that Smallstorm adapted to The Newtown Bee’s video, perhaps to allow people to think that even local residents, like a bus driver who had daily contact with the SH students believes that it was a hoax. The "guy" said that he had a hard time believing that a "mentally-ill kid strapped forty pounds of ammunition and armor to his body and walked up to the school without any video surveillance..." (Video 2). This "guy" who trains and works out is wearing earrings. Notice the golden marigolds. They only bloom in the spring, summer and fall and would be dead by December. The "guy" supposedly made the statements in the SH parking lot after 12/14/2012, a school they never used after the deadly event. 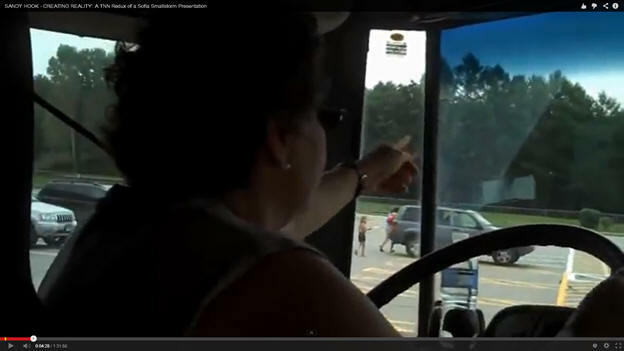 Is that a teacher with her child taking supplies out of the back of her vehicle in the background? The "guy," at this point, says while pointing at the SHES “to date I have not seen a single crime scene photograph of the inside or the outside of that school.” Of course not, nothing had occurred yet. One can see people in the background, probably before school even started in the fall. If this was after the event, as implied, these people would not be there. The grass is green, not brown as it would be in December. The grass was brown in the scenes below where they are evacuating the children from the school. The marigolds are dead in the photos below as opposed to the way that they looked earlier. 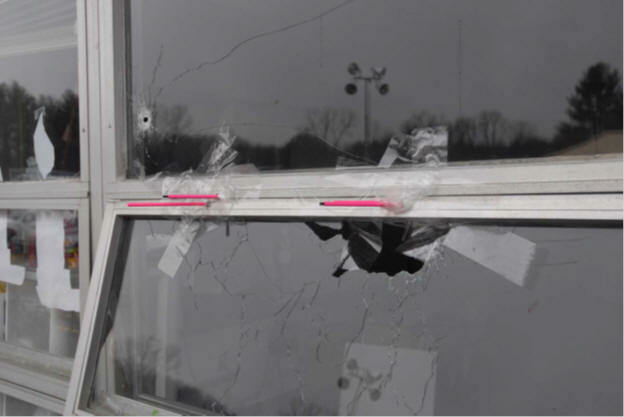 The photos below are part of the crime scene photos taken on 12/14. They cordoned the school off by December 26. Background at the school in December. 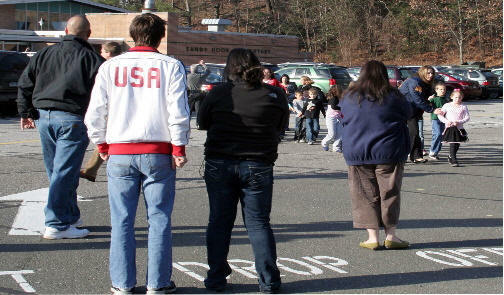 The photo, taken by Shannon Hicks of The Newtown Bee, shows one group of children leaving the school. It was not shot earlier as Smallstorm claims. Fetzer once claimed that the lady in the navy sweat jacket is Shannon Hicks. Actually, she was a parent who had two children who attended SHES. 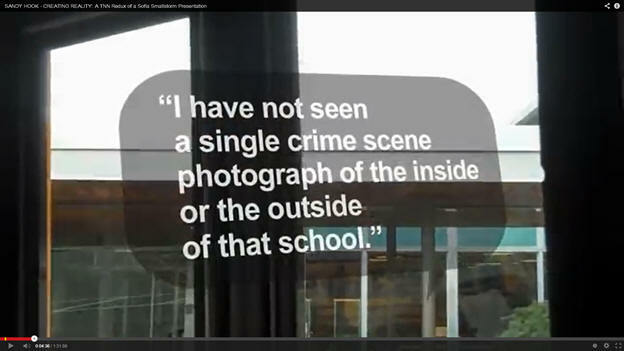 (Video 2) Smallstorm then comes onto the screen and reiterates, "the guy in the video says, 'I have not seen a single crime scene photo of the inside or outside of that school.'" Who is this "guy." A researcher should cite his/her sources, especially if that source/person claims expertise. 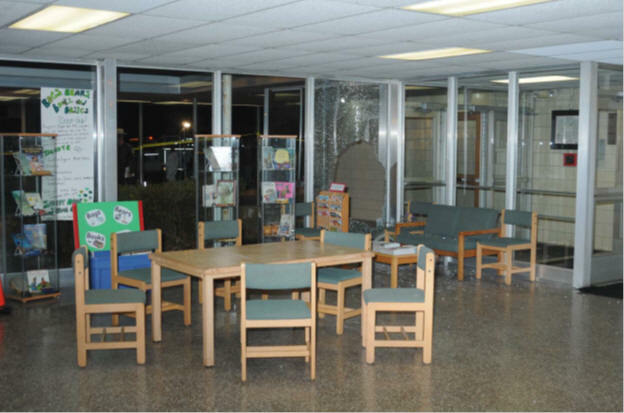 ** (see note at bottom of page) There is no broken glass because the shooting had not happened yet. 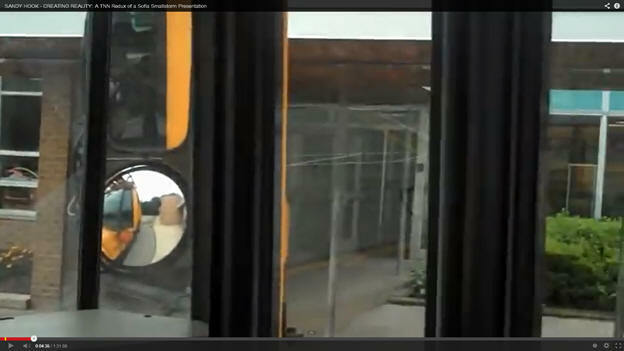 The Newtown Bee video was taken before school started, the video that Sofia “borrowed” that featured a man’s voice. Where did she acquire the audio? This is where the music gets very loud. Possibly in an effort to frame the debate, Smallstorm released her video (11/5/2013) just prior to the release of the official report which redacted crime scene photos which do not clearly show dead bodies. In most states, officials do not release crime scene images showing bodies. The reason that we saw bodies at Columbine is because they were leaked. of the window measured approximately 35.33 inches wide and 42.5 inches high. 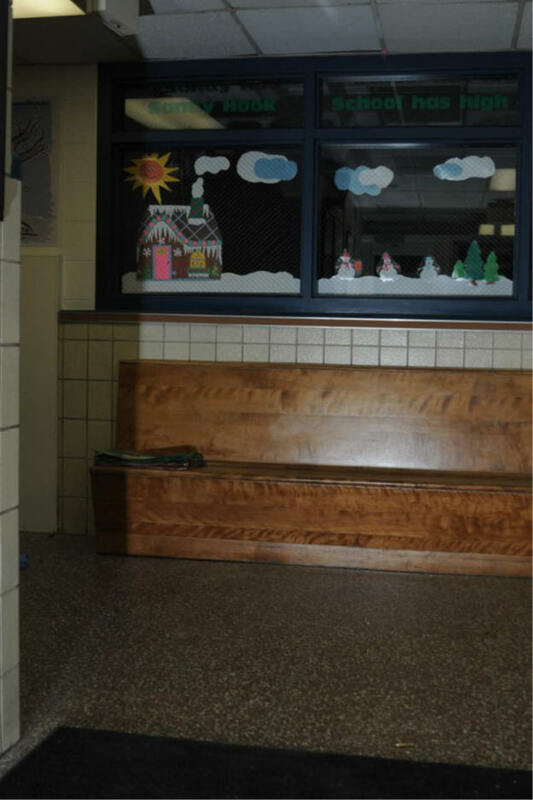 Here are just four photos, above, to the right, and below with Christmas decorations in the school. Yet, Smallstorm We maintains that there were no holiday decorations at the school. Photo A: There was a video camera at the front door which could be viewed live on three monitoring systems on the secretaries’ desks in the main office, with no recording capabilities. 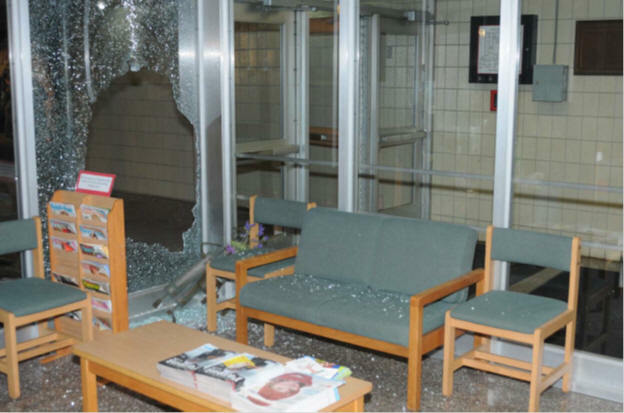 Photo B: This photo shows the lobby area into which Lanza broke into by shooting out a window. 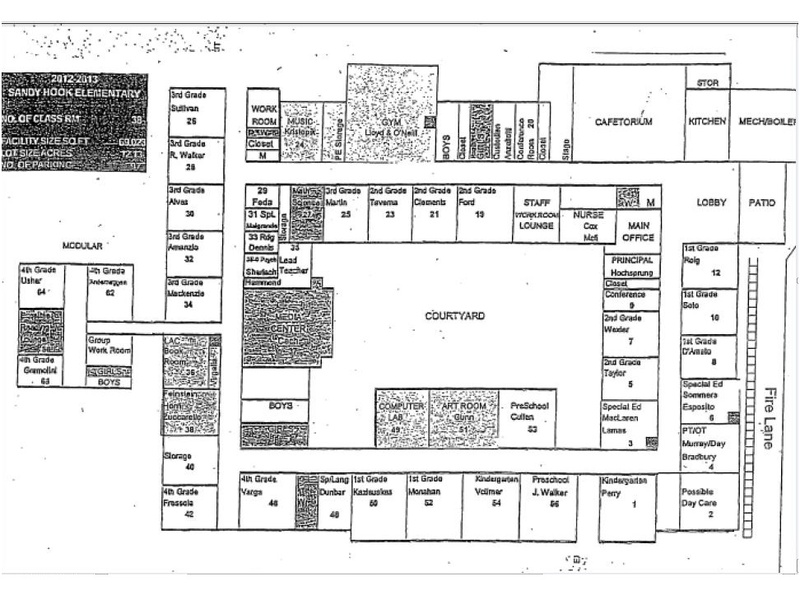 The lobby measured approximately 28 feet north to south and 36 feet east to west. 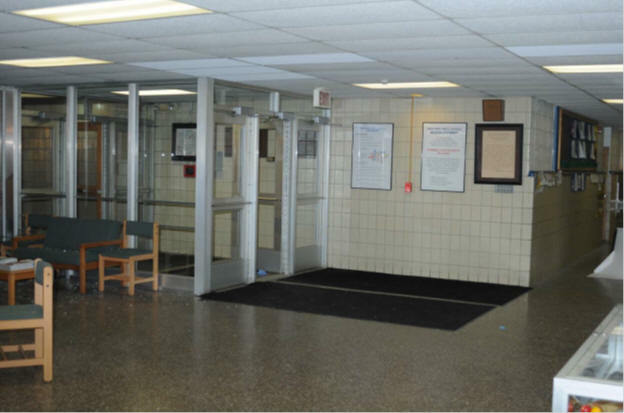 The southeast corner of the lobby allowed open access to the north hallway of the school. Photo D: This image, according to Smallstorm, demonstrates that there was no security cameras outside of the building before 12/14/2012. Were they installed after the shootings? 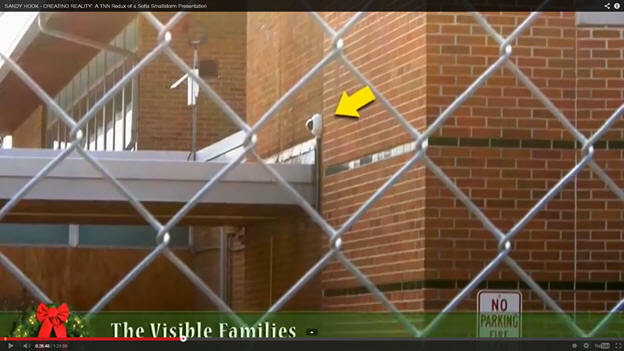 Photo E: Another view of the outside security camera. The chain link fence was up by 12/26/2012. 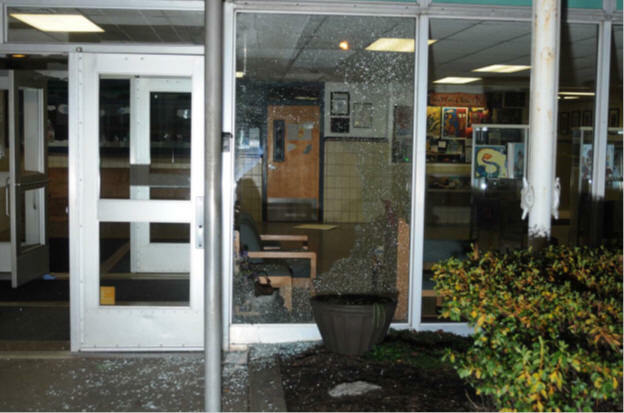 According to Kristen V. Brown and Ana Ley, writing for the News Times, of Danbury, in an article entitled For Many, Sandy Hook School Should Be Razed, published on December 26, 2012, officials had already cordoned off the school with razor wire and a chain-link fence, making it “inaccessible to anyone without official business.” Long before the tragedy, they had considered closing one of the elementary schools due to decreasing enrollment. Please view the photos associated with their article. Considering the school was cordoned off, there was no way that anyone could have interviewed a "guy" on a bus or, as implied, the bus driver, after the event. Smallstorm's entire bus scenario seems to be designed to deceive the people who have erroneously placed their trust in her "research." 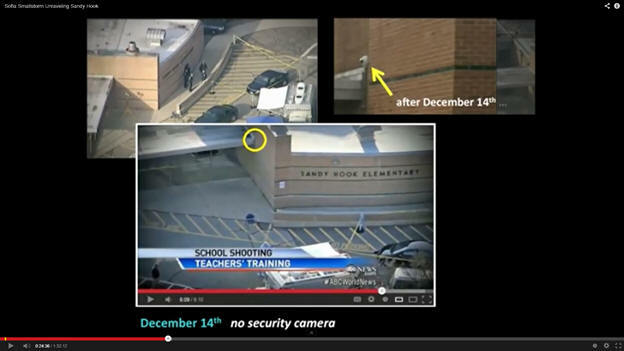 On December 21, Bradley wrote Sandy Hook massacre: Evidence of official foreknowledge? 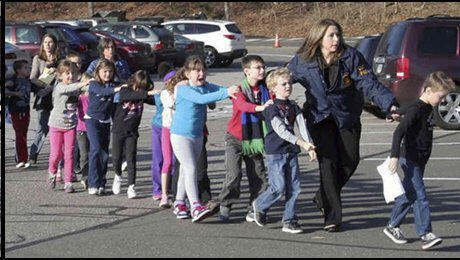 On January 27, Bradley was on a radio program to discuss The Sandy Hook Massacre, What Really Happened? ** Regarding the music, on November 10, 2013, at the Coto Report, Smallstorm said, "The music is a beautiful piece from Tchaikovsky’s Nutcracker (Waltz of the Flowers). The opening video is simply an introductory to the rest of the presentation. 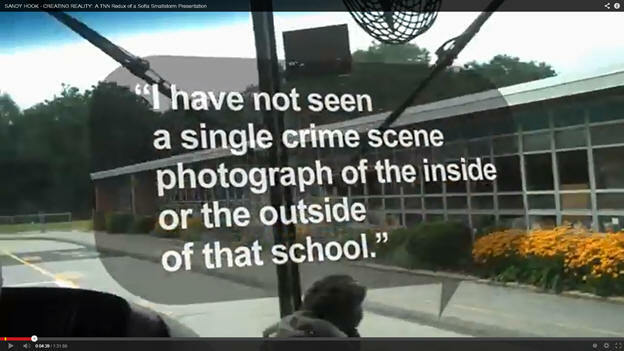 It consists of a commentary from an unknown person about guns, shooting expertise, media reports of Adam Lanza, etc., which commentary was appended to a video of a bus ride to the school that originally came from The Newtown Bee, and I chose, for lyrical and dramatic purposes, to add a classical Christmas musical composition to this two-part YouTube compilation. 'Unraveling Sandy Hook' was originally a live performance, and one typically allows the audience to settle down and get ready with an introduction. People who know classical music would understand that the music (a Christmas classic) is intended to soar and be dominant, with the narrative secondary." Smallstorm admits that she used the opinion of an "unknown person." How could he be an unknown person; where did she retrieve the audio clip? Did she not notice the URL; did she not note the radio interviewer's name Sean? The music got very loud when Sean was talking with "the guy." She implied that she doesn't know who he is, yet we are supposed to accept his opinion. We want evidence, not opinions from an "unknown person." Keith Johnson, a former investigative reporter for the American Free Press, discovered that the "guy" that Smallstorm is referring to is Mark S. Mann (Marksman) who claims to be a firearms industry "insider" and a part-time lieutenant with some unnamed Connecticut police department. The interviewer turned out to be Sean with the SGT Report. On May 3, 2015, Sean interviewed Smallstorm and Mann on his radio program, a very informative show about the biological attack on the environment and humanity. ***Thanks to an informative email from Kelley Watt, received on 2/13/2014, we now have the source of Smallstorm's introduction to "her" video. Never having compiled a video myself, either for profit or for educational purposes, I cannot fault her for borrowing other people's work as it must be a very difficult task. 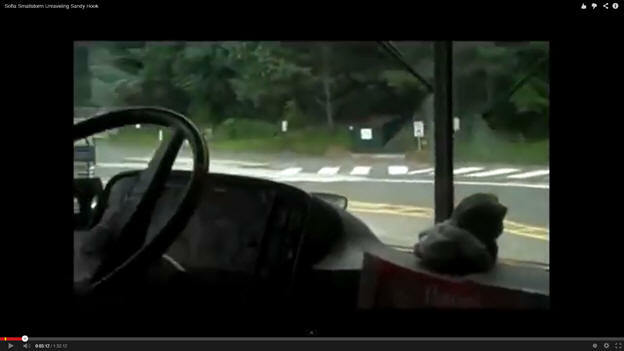 Update: See the original Newtown Bee video titled A Quickened Tour Of Sandy Hook: A Trip On Bus 30 they shot and uploaded on August 19, 2009, yes 2009. It was part of a Back to School special for the August 21, 2009 edition of the newspaper. 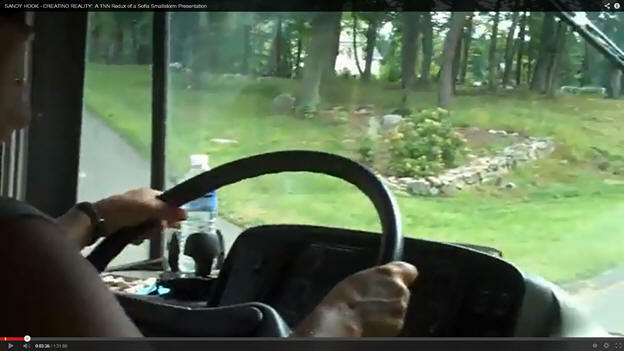 How could Smallstorm not notice the audio and other glaring inconsistencies in the bus scene video that she used? Did Mark S. Mann dub the newspaper's video? 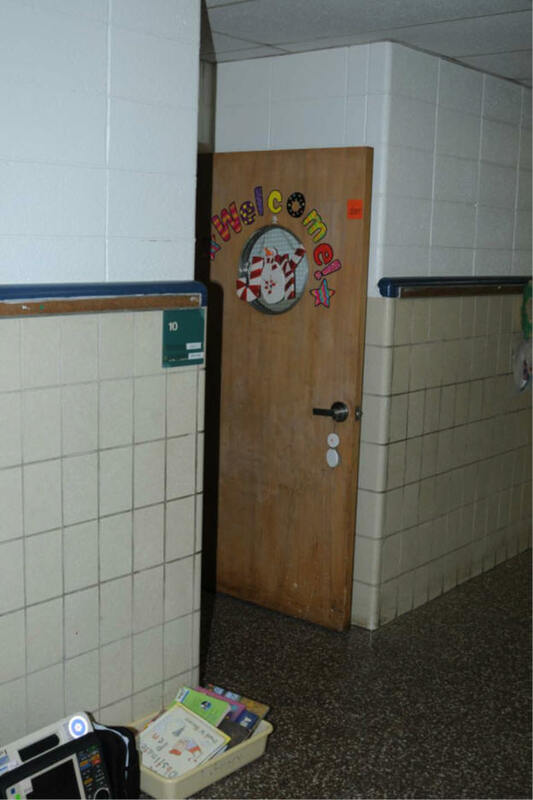 Some people claim that the school had not been in use for five years before 12/14/2012 which would mean 2007. If that were true, The Newtown Bee would certainly not have used that school in a back-to-school video. On February 23-25, 2007, at the consensus-building 911 Accountability Conference at the San Marcos Resort, Chandler, Arizona, Smallstorm, then known as Sofia Shafquat, born in Karachi, Pakistan, was billed as the creative force behind the video, 9/11 Mysteries: Demolitions. She presented a talk titled, Intellectuals Speak Out. Apparently, according to one report, of November 28, 2009, Dr. Steven Jones supplied much of the scientific data that she used in her video. Air America interviewed her on 10/05/06 about her video. She was also instrumental in helping to launch the young men who made Loose Change. Dylan Avery, Director, Editor, and Founder of the group that produced Loose Change, Final Cut said in his remarks, “In June 2005, my best friend Korey departed from the United States Armed Forces to come support the cause, and by July 2005, after a trip to California to visit KPFK 90.7 FM and Sofia Shafquat, it was apparent that Loose Change had taken on a life of its own.” Her videos seemed to have functioned as the standard of belief, as least regarding 9/11 and now she seems to function in the same way with Sandy Hook. Her 9/11 video possibly provided a foundation for Architects and Engineers for 9/11 Truth, a group founded by Richard Gage in 2006. Someone asked me why The Newtown Bee did not sue her for plagiarizing its video. It might be because she is not the person who borrowed the newspaper's video footage. Perhaps that is the reason that she did not know the name of the "guy" in the video that she found on the internet. Therefore, she really did not dub the voice into "her" video; it was someone else. However, she did add the music, reportedly for the purpose cited above. 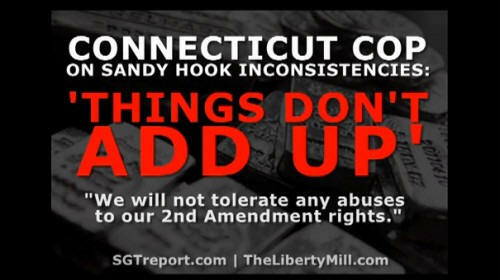 One of Smallstorm's seemingly favorites phrases in "her" video, when speaking of inconsistencies about Sandy Hook is, "One has to ask." I am really surprised that some of the astute people who depend on the alternative media as a source of information and truth did not notice the glaring inconsistencies in her video. But, as I have previously implied, video and television producers understand that these vehicles have a mesmerizing quality that subtly seduces the viewer. As Smallstorm says regarding television drama, "we suspend our active awareness." That is also applicable to "alternative" videos created to promote theories as facts. 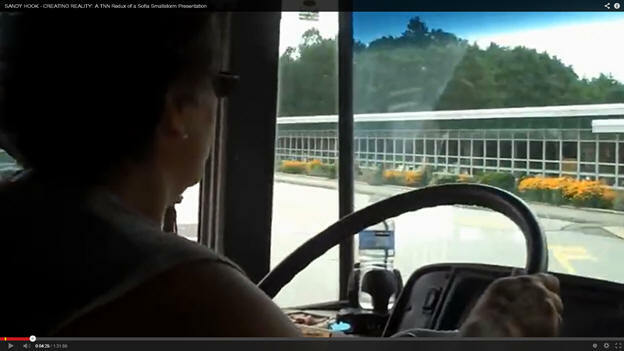 The video, the one that Watt so kindly provided, also gives the name of the bus driver in actual text on the screen, Marsha Moskowitz. 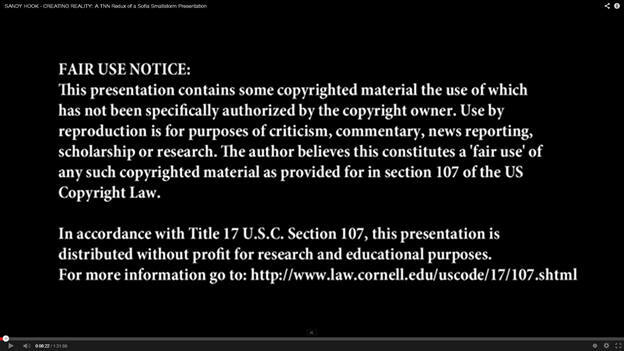 The source video was published on February 26, 2013 and apparently was the video that Smallstorm used in her presentation at the Conspiracy Con at Milpitas, California, June 1-2, 2013. Again, thank you, Kelley Watt for this piece of vital information. On December 18, 2012, just four days after the shootings, the SGT Report published the following, "Firearms industry expert and part-time police officer Mark S. Mann (pseudonym) lives in Connecticut, just miles from the massacre at Sandy Hook Elementary. He’s been following the story closely, talking to cops he knows in the area and he will be reporting for us as this story develops. Mark says there are just too many inconsistencies with the ‘official’ story and he says, 'things don’t add up.' As we all now know, regardless of whether the mass murders of children and adults at Sandy Hook was a false flag operation, or the actions of a lone nut, the establishment intends to use this event to attack the Constitutional rights of law abiding Americans – they’re coming after the guns."